Summary: Fifteen-year-old Serena is the youngest member of a dying race. The increasing acidity of the ocean is destroying her home, slowly eating away at the once thriving underwater landscape. But since the night of Serena’s birth, it is an outside force that most threatens their dwindling population. Werewolves, who once served as protectors for mermaids in the Kingdom of the Undine, now seek to eliminate all who dwell in the ocean — and Serena is about to find herself right in the middle of the deadly conflict. Review: Who doesn't love mermaid stories? My first exposure to mermaids came when I was just a child - I went to a friend's birthday party, and we watched The Little Mermaid. It's classic Disney, but since then I've always carried a bit of a fascination for mermaids and sea-lore in general. 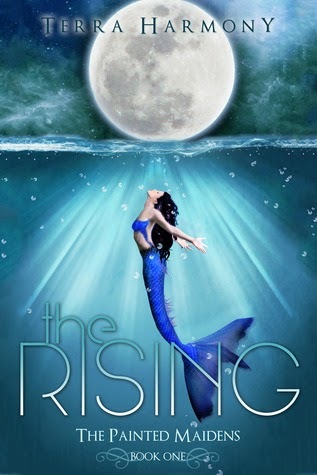 That's probably why I sent a request as soon as I saw the cover of The Rising on Netgalley - the cover is beautiful and almost hypnotic, in my opinion - the mermaid with her head thrown back, hair flowing in the water, the moon hanging overhead... Then there's the fact that it said right in the summary that werewolves were involved, and I was hooked. The first thing that I will say about this book is that if you struggle with the present tense, you might have some issues with this book. It's not quite Hunger Games-eque, because we're not in Serena's head - we're still removed from her, and that means that you might find yourself a bit out of your comfort zone with this. It took me awhile to adapt to it and I'm still not sure that it was quite right for the book, coming across with a slightly amateurish touch as I was reading. Terra Harmony immediately takes us into an interesting world, though. Serena is an orphan, and her world is under threat - from the werewolves, from the dying seas around them. I especially liked the second inclusion because it's all too true - the environment is important to me, and I liked the inclusion of the fact that the creatures in the oceans are facing real danger. I especially liked the descriptions of how Serena changes back and forth - it makes sense and throughout the book some interesting questions about how mermaids procreate are answered, too - though not with too much detail. The trouble I mostly found with this book was that the plot meandered a bit. Characters are opposed to Serena but she doesn't have a clue and neither do we, as readers - this drags on for quite a bit of the book, and when the reason was revealed I honestly wasn't expecting it. I suppose I should have been, thinking back on it, but I didn't really find it all that satisfying, either - in the overall theme of the story, the big plot reveal is something that just makes sense when you look at general tropes of fiction and fantasy. "Just as she finishes with the last strap, Murphy and Kai dive into the receding tide. Their legs transforming into fins before they even hit water." This happens more than once throughout the book and it threw me out of the flow every time, because it's just very disjointed and doesn't make any sense. Some of the concepts also forced me to really stretch my willingness to set aside my disbelief, which was unfortunate, because some of the ideas really worked for me! The idea of the powers that mermaids have, and how they live, the society they've built - all great, and I enjoyed reading about them. Then you bring in their connection to the werewolves and it just really tried my patience. I'm still not even sure what I think of the end of the book and how it fits with the tone of the rest of the story - not so much what's happening, but how it was conveyed. It's a bit dark in comparison to the writing that fills the rest of the book. Overall I would say that the book was... okay, I guess. I neither loved it or hated it. I do wish that Serena's story had gone in a different direction - the direction I thought it WAS going at first would have been fascinating, but it definitely did not go that way. Still, a worthwhile try for those who love mermaids and want more mermaid fiction. Disclosure: Arc received through Netgalley in return for an honest review.